The Ravana is portrayed as strong Demon King who took Sita and a major antagonist to Ram in Hindu Epic Ramayana. His ego, pride, and sins in late life made him evil and cost his life but his good sides are also highly sung among many Hindus. 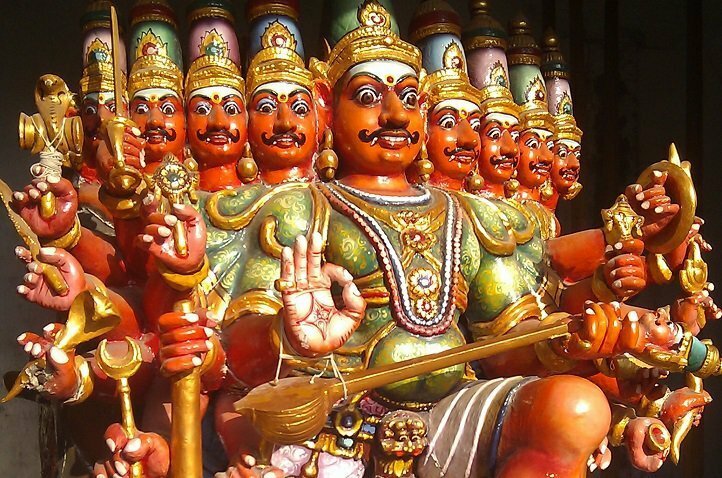 The 10 headed, 20 armed Ravana was blessed by Shiva to possess those after he offered his head to Shiva. The Devout Shiva Bhakta Ravana, also composed Shiva Tandava Strotam to please Lord Shiva, after his failed attempt to take Kailash to his palace in Lanka. The devout Shiva Bhakta Ravana was a great Scholar as well who had knowledge of all six Shastras and four Vedas. His Veena (Indian Musical Instrument) playing skill were astounding and matched levels of Rishi Agastya. Apart from his Bhakti, Scholastic, Musical abilities; Ravana is also known widely for his Ras Siddha Yoga. The stories of his Golden Lanka (Golden Palace) in Lanka still lives and his Ras Sidha Yoga (Alchemy) abilities have been connected to it; it is believed that he was able to change Parad (mercury) to Gold. His Ten heads are believed to be a representation of Kama (lust), Krodha (anger), Moha (delusion), Lobha (greed), Mada (pride), Maatsyasya (envy), Manas (mind), Buddhi (intellect), Chitta (will) and Ahamkara (the ego). Following the war of Ramayana of Ram along with his army of Vanaras against Ravan and his army, Lord Ram finally succeeds to win over Ravan and kill him. However, before Ravana died after being hit by the weapon used by Sri Rama, which was believed to be given by Sage Agastya, Rama asked Lakshmana to gain knowledge from him at his deathbed. As Sri Ram knew about the abilities and knowledge of Ravana. Upon hearing his brother, Lakshmana went and stood near the head of Ravana, only to be unanswered. Then, Lakshmana returned to Rama and told his brother he was unable to be guided by Ravana, as Ravana did not speak. Rama asks Lakshmana to stand near feet of a teacher because a student could not stand near the head of the teacher. Then, Lakshmana proceeds to stand near feet of Ravana; upon seeing Lakshmana near his foot, Ravana teaches him short lessons. Lakshmana would instantly agree to Ravana and quote “शुभस्य शीघ्रम्” (Shubhasya Shighram). Rama sent Lakshmana to learn these Lessons From Ravana Before He died. 4. You should trust the minister who criticises you. 7. A King who is eager to win glory must suppress greed as soon as it lifts its head. Ravana said, “One should do auspicious (good) works as soon as possible and delay inauspicious (bad) works as far as possible and avoid them”. He meant, he did inauspicious work of taking Sita right away, if he had waited for Ram, he would not have suffered faith of his death. Never let yourself become enemy of your own charioteer, gatekeeper, cook, and brother; they can harm you anytime. Through this, he meant Vibishana, who took side with Lord Rama. Never assume you are always the winner, even when you are winning, most of the time. Do not commit the mistake of thinking your enemy is weak and underestimate them. While asking for immortality, Ravana’s ego took him over and he thought of humans and Monkeys as a lesser being who could not defeat them. He asked to be defeated by humans and monkeys; only to be defeated by Hanuman and Ram. Never think you can outsmart the stars, they will bring you what you are destined to. He meant one cannot evade the cycle of karma and what’s written before his birth. He and his brother Kumbhakarna, both were gatekeepers of Vaikuntha, who were cursed to die from hands of Vishnu Avatar. In his final teaching, Ravana quoted, “one should never announce his life secret to anyone in the world”. He meant his secret to his immortality which he shared with his brother Vibishana, the reason for the loss of his life on the battlefield.